Neptune's Defenders: Salmon wars return to Portland courtroom: Can at-risk fish and hydroelectric dams coexist? 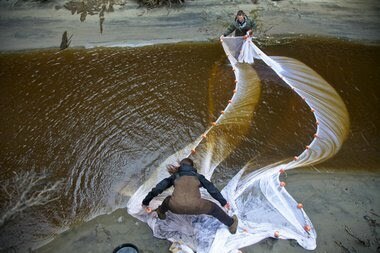 Salmon wars return to Portland courtroom: Can at-risk fish and hydroelectric dams coexist? For the past eight years, the champion of Northwest wild salmon and steelhead has been an 82-year-old judge with a sharp pen and a willingness to use it. To date, U.S. District Judge James A. Redden has sunk two plans the federal government argued would allow it to operate hydroelectric dams in the Columbia River basin without jeopardizing the region's signature fish. In Portland on Monday, he holds what could be his last hearing in the salmon case, a final discussion of the government's third shot at a 10-year plan. He'll have to cut through the fog of fish numbers before handing down a decision with consequences for electricity ratepayers and farmers in four states. Helped by favorable ocean conditions and fishing restrictions, the numbers of salmon and steelhead returning to the Columbia have surged since 2001. Returns -- mostly hatchery fish -- hit post-dam-building highs for much of the past decade at Bonneville Dam, the first on an upstream journey that can run over eight dams and more than 900 miles. Happy Mother's Day from Neptunes Defenders! !